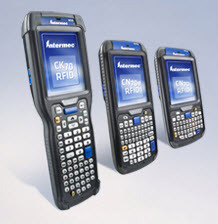 Intermec, a manufacturer of data capture devices for use in logistics, transportation, retail and industrial sectors, has embedded the AS3993 ultra-high frequency (UHF) RFID reader from AMS (Austria Mikro Systeme) in its 70 Series of rugged, handheld computers. The 70 Series, which includes the CN70 RFID, CN70e RFID and CK70 RFID, is a family of ultra-rugged handheld computers designed for use by couriers, shop workers and inventory handlers. The Intermec 70 Series is designed to offer improved data-capture capabilities and long battery life. The AS3993 comprises an EPC Class 1 Gen 2 RFID reader designed for mobile, space-constrained or embedded applications. Its selectable sensitivity of -90dBm supports the use of small, embedded antennas while maintaining excellent read capability in the presence of antenna reflections and a self-jammer. In the AS3993, performance is combined with low power consumption and low-voltage operation, helping to extend battery life. The AS3993 is an all-analog design that uses less power; operation at a power supply as low as 2.7V, and a 65mA current requirement.